Filipino Friday (4): "Going Digital. Do you try other formats of books beside the print ones? What has been your experience with different book formats?" Like what I've mentioned during FF#1, I do like the convenience of reading ebooks. I can always download and read anywhere, anytime, especially during travels, without much space or weight. Audiobooks are no exception either; I enjoy them most when walking. I've come to love certain books because of a good audiobook narrator. Few among them are Emily Gray who narrated Thursday Next Novels by Jasper Fforde; Andre Braugher who narrated Alex Cross Novels by James Patterson; Lenny Henry who marvelously narrated Anansi Boys by Neil Gaiman; and Neil Gaiman himself who narrated some of his children's books. I don't think it's disloyalty to enjoy other formats, as long as you give proper due where it belongs to. I suggest that you look at your shelves, touch those book spines, smell them (if you must), then remember the first time you held your favorite book. I don't think you'll ever forget. We, readers, stay loyal to reading, and that is all that matters. 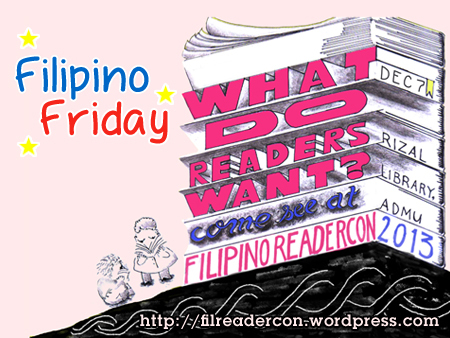 Don't forget, the 3rd Filipino Reader Con: What Do Readers Want? is on November 9, 2013, at Rizal Library in ADMU. Wonderful post, Louize! I share your love for them audiobooks!